It is a realistic-looking raptor that will deter other pests too. The flying motion increases its effectiveness. Snakes are more than a nuisance. Some are dangerous, making getting rid of them imperative. These animals are elusive which adds to the difficulty of controlling them. That’s where a decoy can come in handy to get the job done humanely. Our Top 2 Best Snake Deterrents 2019 review highlights the products that can help you get a handle on your pest problem once and for all. We’ve also included some tips for using them and ways to avoid future issues. Read on to learn more. How Do Snake Deterrents Work? How Can I Make Sure That I Won't Have Snakes in My Yard? It looks like an owl. It will deter rodents and birds too. It has a resealable opening on the bottom to weight it down and keep it in place. It will handle the elements well. It offers a humane way to deal with pests. It has a limited period of usefulness before the animals figure out that it isn’t real. The dimensions are 7 x 7 x 16 inches high. 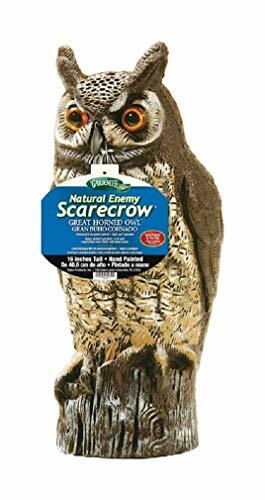 The Dalen OW6 Gardeneer Scarecrow Great Horned Owl relies on the fact that these birds prey on snakes and other small animals. It has the distinguishing features of this raptor including its large yellow eyes and telltale tufts. It has the mottled pattern on the chest too to make it look realistic. It does indeed resemble a living one enough to fool pests. The deterrent isn’t quite as tall as a mature owl. However, pests recognize the shape and form which is the key to keeping them away from your yard. It has a 100-percent money back guarantee. It holds up to the elements. It moves for greater effectiveness. The quality of the product seems cheap. It measures 20.2 x 5 x 3.8 inches. It is made of lightweight plastic. 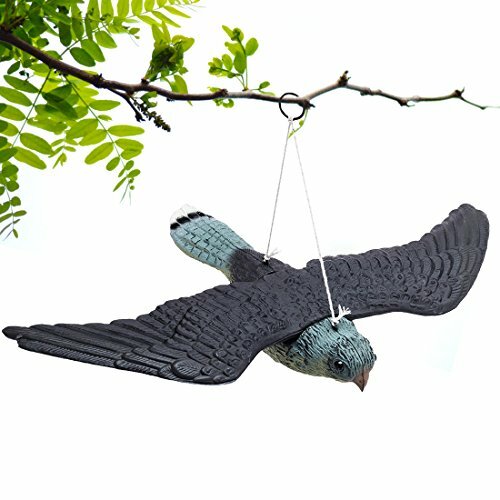 The briteNway Premium Bird Repellent Fake Flying Hawk Decoy offers the same type of solution as the previous product with a different riff on the common theme. Several species of these raptors prey on snakes including kestrels and broadwing hawks. The gray coloring makes it look like a harrier or marsh hawk, another predator. This one moves with the breeze to make it appear more realistic and alive. While the pests may catch on after a while, you’ll get more use out of it in the meantime. Birdwatchers may question the details, but it’s the shape of the decoy which is essential as a deterrent. Snakes, like other species, strive to conserve energy. Perceiving something that may harm them is a potent deterrent. Now that you know the best deterrents, it’s time to learn the best ways to use them for optimal results. After all, there are two things on the line. You want your money’s worth, and you have to get rid of the snakes. We’ll discuss what you need to know to make both of these things happen. These products are similar to similar ones with a like function against other pests. They put up a barrier that the targeted animal will recognize as a threat in the hopes that it will keep them from entering a designated space. They include unpleasant odors, sounds, or images. Snakes, like other species, strive to conserve energy. Perceiving something that may harm them is a potent deterrent. The best way to manage them is through prevention. Seal any holes or leaks in your foundation and around areas where utilities enter the structure. Repair any damage to screens. Also, you may find it helpful to install weather stripping around your exterior doors. Spiders aren’t unlike other pests like mice which will seek warm places—including your home—when it gets colder. They feed primarily on other insects. By getting rid of them, you’ll remove a reliable food source that may attract them to your home in the first place. They are opportunistic and will seek out the resources they need to survive. Keep your kitchen and other food prep areas clean to avoid luring their prey to your dwelling. First, spiders are not insects but instead another distinct order of organisms. They have eight legs and two body segments, unlike the latter which has six and three, respectively. They are predators which will take insects and even other spiders as prey. As we detailed above, not all of them are harmful no matter what their size. And you can rest assured knowing the rumor that the average person swallows several a year in their sleep is just an urban legend with no basis in fact. However, while they’ll kill other insects, getting rid of them is the surest way to restore your peace of mind. How Can I Make Sure That I Won’t Have Snakes in My Yard? The best way to ensure that you don’t get these animals in your backyard is to avoid creating shelter for them. Many snakes will seek out hiding places under vegetation, in wood piles, and anyplace else where they won’t be disturbed. Clear out areas where it may accumulate and keep these places clean and open. Make sure to mow your lawn regularly too. The advantage of taking those actions is that you’ll also prevent rodents from taking up residence too. They are a preferred food of many reptiles. Without a place to hide or something to eat, the snakes will likely move on to other sites where they can get what they need to survive. If snakes are in your house, you’ll need to seal any cracks or openings that provide access inside. You may find it helpful to install a solid fence around your yard in extreme cases to create a physical barrier.